We live in the age of multi-channel marketing and your instagram feed is a powerful tool to complement your efforts. The rate of adoption is on the uptick. With over 1 billion users, this is a great time to take lessons from B2C brands as they engage with millions of followers. However, the highly visual platform requires a compelling first impression with images that attract. Having recently launched my B2B brand @agilitythink on Instagram, I decided to gather my observations as a guide for effective visual strategies. With a plan to convert to a business profile later this year, I will also launch a growth marketing program to build the audience. My background in art and design is the biggest influence on my opinions, even though I have also worked as a tech marketer, speaker, author, and career growth analyst. My recommendations are a result of being attracted to and analyzing hundreds of highly established profiles, along with some newer pages that are gaining traction. The style of your profile is an important part of your professional personal brand. 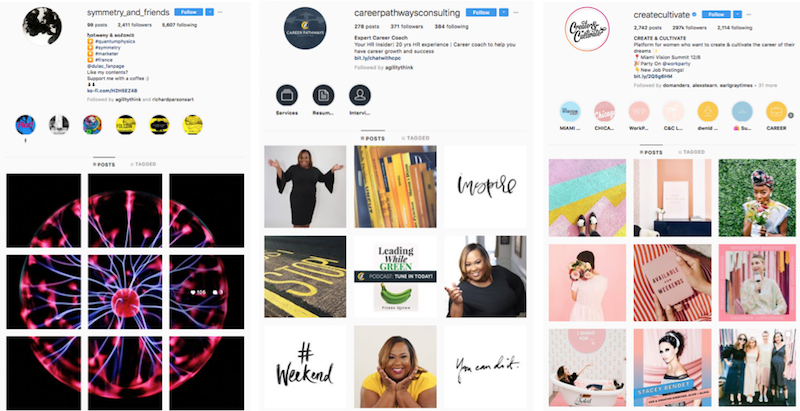 This article is for business-to-business (B2B) consultants, creatives, freelancers, and small businesses using Instagram to become known and attract a following. The long term strategy is to build a brand that appeals to connectors, potential customers, and partners. Your presence will be more effective when you take a brand management point of view of your channel. Without this, viewers will never read your lovely copy accompanying your photo or illustration. And from what I’ve seen, Instagram is fast becoming the home of the mini blog post. You don’t want to waste your copywriting effort because your photo did not attract someone’s interest. While scrolling through Instagram, I noticed an inquiry, “A picture can be worth a thousand words—especially on IG—but where do you obtain such images?” Stock, original, or other? As Instagram has matured into a business platform, Insta no longer means instant for organizations or individuals who want to grow their following of clients, potential customers, and partners. Reflecting on the evolution of the platform, from instantly shared photos to carefully selected galleries and stories, savvy business users think about the social channel in a more strategic way. The quality and type of image selection, whether curated or created, moves up a notch when followers, connectors, and potential customers are at stake. This article focuses on a visual style for the business user, and will defer the topic of written content for another discussion. To answer the question about where to acquire images, we will review three phases of the instagram branding process. Following these steps will result in a well-positioned visual brand architecture. With a system in place, selecting images will be easier. Let’s get started on the three steps toward visual mastery. As you follow the steps, consider these questions. What are your business goals? Who is in your industry? Are you supporting a major brand? Does your business focus on innovation consulting? Or are you a leadership coach working with high-performance executives? Being specific about your audience is required for building a following. Using these steps, I established an ecosystem of followers, influencers, customers, potential customers, partners, other analysts and consumers of my information. For my channel, the list includes career coaches, executive coaches, organizational development professionals, HR, culture management, business strategists, and corporate buyers of learning and development services. As Nicole Emerick mentioned earlier, you don’t have much time to capture attention. If you are intending to use Instagram to attract business, you will need a signature design system that is unmistakably you every time your image passes them in their feed. You will want to stay visually on brand, and for the top 9 to flow consistently with your messages. An effective grid and image combo tells a story. 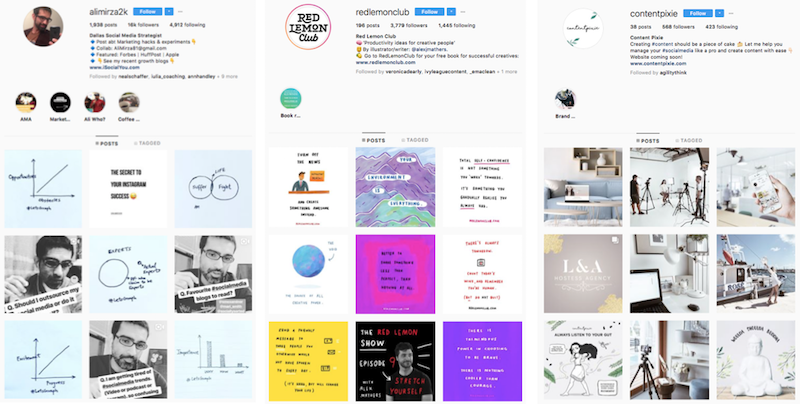 A unique color scheme and grid, consistent filters, and steady use of consistent typeface(s), are elements of a distinctive Instagram grid. Square photos: consistent color and filter use. This is the most common. Checkerboard (or contrasting tiles): user alternates between two different types of images (A quote may alternate with a photo) This is what my profile @agilitythink uses. Row by row: 3 images tell a story. Page looks like a series of stories. Vertical lines: a contrasting color, series of quotes, etc. down the center of the feed. Here are some examples of signature grids. My profile @agilitythink applies the checkerboard approach. Create a memorable and unique array of images. Although Instagram features stories and videos, this article will focus on the design elements and visual style that make up the signature grid. You can mix and match these elements for design appeal. Same filter usage on photography, illustration, quotes, charts, and diagrams. According to Infotrends, 1.2 trillion photos were taken in 2017, largely due to smartphone usage and social media post habits. One hundred billion more photos than taken in 2016. That’s nearly 3.3 billion photos per day! Which brings me to a practical idea. Given the ease of taking photos, consider the use of original photography via your mobile device. The quality of phone photography exceeds all resolution requirements for social media and blogs. Make your photo sessions part of your daily walk to work, or commute on the rails. The benefits of taking and posting your own photos include: no copyright issues and a 100% unique feed. As you consider your abilities, experiment with selfies for impact or have a friend take some photos of you in varied locations. As a part of personal branding, many business professionals schedule photo sessions of themselves at work, industry events, and other creative environments. And for those of you who like to sketch, experiment with sketches within your stream! I’ve seen some amazing pencil sketches and whiteboard illustrations. See @alimirza2k above as an example. If you comply with photography and illustration licenses, you’re good to go with downloading and sharing. Note, however, even tools like Canva and Unsplash have rules. For the most part, sharing downloaded images on social media is acceptable on these free sites. However, there are strict policies against using photos and type on printed products for your business. Make sure you read the fine print! Consider giving credit to the photographers. It’s not usually required if downloaded from free sites, but it’s good manners to express thanks to these artists who offer use of their photos for personal or commercial use. And if you are inclined to take on a photography hobby, you may luck out by discovering a delightful form of creativity! With some effort, your remodeled profile will attract followers and increase engagement. Of course, your written content, use of hashtags, and advertising strategies will work with your visual approach to build an audience. And the next time your images and signature grid cycle through the platform, your unique style will create a memorable impression with people you are currently working to attract.